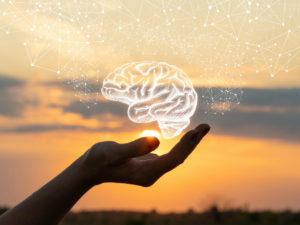 Regardless of how long after a neurological injury takes place, the brain can learn and change—generating new connections and strengthen existing connections. Results are lasting. Neurofeedback is not simply a brain game and no energy is introduced into the brain. Just like exercising our muscles, we can exercise our brain to optimize functioning. Neurofeedback has been found to be effective for sleep, mood, focus/attention, social awareness, learning and memory, impulse control, mental stamina, speech, motor skills, trauma, confidence, and much more. See the extensive list of research articles at https://www.isnr.org/isnr-comprehensive-bibliography (scroll on right for desired topic). What about Dementia? There are many different forms of dementia. Factors to consider include current and past lifestyles, toxic exposure (including chemotherapy), medications, and head injuries, that can contribute to slowing of brain functioning over time. It is important to use a holistic approach to address issues related to cognitive decline. Dr. Buck was trained in the field of rehabilitation counseling and is uses that foundation to support, advocate, and empower individuals with disabling conditions. Traumatic Brain Injury: Neurofeedback was found to be more effective than traditional methods for intervening on symptoms resulting from traumatic brain injury. Reference: Thornton, K.E., & Carmody, D.P. (2008). Efficacy of traumatic brain injury rehabilitation: Interventions of QEEG-guided biofeedback, computers, strategies, and medications. Appl Psychophysical Biofeedback, 33, 101-124. During the 1960s, researcher Barry Sterman accidentally discovered that cats that had been trained through operant conditioning to increase amplitude of 12-15 hertz (SMR) were seizure resistant. This study was seminal in the field of neurofeedback and has led to many studies showing stabilization of seizure activity.